How do I know if a BRC is eBRC or manual BRC? From 17.08.2012, banks transmit all BRC data electronically to DGFT. Such BRC is called ‘e-BRC’. BRC issued in physical forms by bank before 17.08.2012 is termed manual BRCs. If my BRC is ‘eBRC’, is it mandatory for the Shipping Bills to be EDI? Even non-EDI Shipping Bills can be linked to eBRC. Once I have added Shipping bill to the repository, do I have to add it again? Once the Shipping Bill is added to the Repository, it is available for utilization. You can view it by going to the shipping bill repository. Can I use my Shipping bill in multiple Schemes? However, you are not allowed to use it in the same scheme twice. Example. If you have used your shipping bill for DEPB scheme, you cannot claim benefit again under the DEPB scheme. However, you can use the same shipping bill in any other eligible scheme. My shipping bill has multiple products, each eligible under different scheme. For claiming benefit under Various schemes, I need separate realization value for each product. However, I see a problem here as banks report only one consolidated realization value for each Shipping Bill( even if there are more than one item on a single shipping bill ). How this value is to be distributed against multiple products in Shipping Bill for the purpose of making applications under various schemes? In case of multiple products on a shipping bill, the FOB value will be proportionately distributed to its product list and multiplication factor applied on it. This can be easily understood through the following illustration: Suppose a Shipping Bill contains 3 export products A,B and C with FOB values US $40, US $60 and US $80 respectively (total FOB US $180/-). Who will enter Commission,Insurance, and Freight in the application? Exporter will enter these details. BRC details available in the DGFT server do not contain values of Commission, Insurance and Freight. These are to be entered by the exporters while making applications under various DGFT schemes. What happens if banks have reported BRC which is less than total realized value? Exporters must ensure that the ‘e-BRC’ value reported by bank reflects total realized value. If a bank has erroneously transmitted less than total realized value after deducting components like Freight, Insurance or Commission, exporters should get it corrected from the bank. I realized less foreign exchange compared to the FOB value declared on the shipping bill. How this shortfall is to be adjusted for the purpose of calculating entitlement under various schemes? Illustration 1 (Single Export Product) – If foreign exchange realization as per e-BRC is US $ 100/- and FOB value mentioned on the Shipping Bill is US$ 80/- , the benefit would be granted on US $ 80/-. Illustration 2 (Single Export Product) - If foreign exchange realization as per e-BRC is US $ 100/- and FOB value as mentioned on the Shipping Bill is US $ 120/- , then FTP benefits would be granted on US $ 100/-. Suppose a Shipping Bill contains 3 export products A,B and C with FOB values US $40, US $60 and US $80 respectively (total FOB US $180/-). Multiplication Factor (M.F) defines the ratio between the FOB value actually realized and FOB value mentioned on the Shipping Bill. FOB value actually realized in Rs. Shipping Bill FOB in Rs. Value of M is to be restricted to actual value or 1 whichever is less. It will be rounded off to six decimal places. What is Net FOB ( FOB excluding commission)? How is Net FOB value calculated from the value realized in foreign Currency? 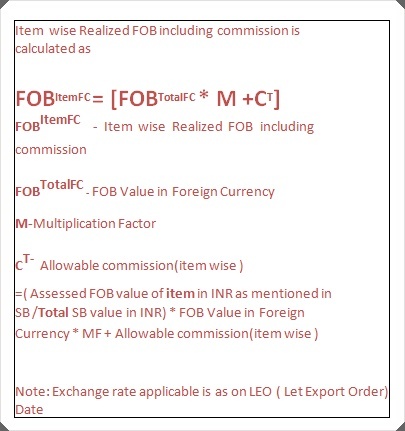 Net FOB is calculated by excluding commission from the FOB value in Foreign Currency. Net FOB parameter is used to factor correct amount of commission allowable under various schemes. Freight, Insurance and Commission values should be actual transaction values. How Commission is factored under various schemes? Commission is treated in 2 ways in FTP schemes. For the purpose of calculating entitlement, commission amount is to be restricted to actual value or 12.5% of net FOB value realized; whichever is less. For the purpose of calculating entitlement, commission amount is to be excluded. How is Realized FOB including commission calculated for DEPB and Chapter 3 schemes? A message was displayed on DGFT website advising the applicants to either submit or delete shipping bills from DEPB/Chapter 3 schemes themselves. Such shipping bills which were not deleted by the exporters themselves have been deleted by the system. What precautions should be taken by the applicant at the time of making a Licensing Application? Whenever manual data is updated same is entered correctly. Commission, Insurance and Freight is properly updated against each BRC. How can I take a print out of eBRC for my use? We are developing system for allowing printing of eBRCs. A method also is being worked out for sharing of e-BRC is with different agencies. Sometimes, I realize forex in parts, necessitating the need for issuance of more than one BRC.Is it allowed? Yes. DGFT system can process multiple BRCs issued against a Shipping Bill. Exporter should apply after receiving full payment. Can I view all information filed by me on a single screen? Should banks deduct commission from the full realized value? Banks must mention full amount realized. You must approach banks for restoration of full value. (i) My buyer released the full amount of $100 to the foreign bank but the foreign bank deducts $10 as its charges and remits $ 90 to Indian bank. What is the correct realization should be mentioned by the Indian Bank while issuing the eBRC? (ii) If the bill value is $100 but the AD bank in India receives only $90, what is the correct realisation value that should be mentioned by the Indian Bank while issuing the eBRC ? The e-BRC has been uploaded by the bank and is visible and available on the website but when I go to the Shipping Bill to attach BRC, it says “No Record Found”. Please check the Shipping Bill Number, Shipping Bill Date and Port Code. It should be identical in BRC as well as in Shipping Bill to enable automatic matching. Even a small difference may result in Non-Selection of BRC details. Example: Shipping Bill No. on shipping bill is 0790173 and on BRC it is NSA1 0790173. Note: eBRCs issued prior to 17.08.2012 are not eligible for auto attach to shipping bills. Their details need to be entered manually by the exporter for claim of benefits. Treatment of such eBRC will be like manual BRC. However, to facilitate the data entry, BRC’s between 01.04.2012 to 16.08.2012 reported by the banks will be attached with “Manual”. I have EDI Shipping Bill for Drawbacks/Free Shipping Bills. Same I am unable to link to shipping bill repository from customs database. When I enter the same manually in Repository, it shows as Shipping Bill is manually entered in the application. Shipping Bill data from Drawback and Free Shipping Bill are currently not being exchanged with customs, hence they need to be entered manually. Since Shipping bills are entered manually for DGFT purposes, their treatment will be like a manual/non-EDI shipping bill. I have an EDI Shipping Bill on which I have claimed DEPB. Now I want to claim chapter 3 benefit on that but it is not showing that in customs link. You may enter the Shipping Bill details manually and claim chapter 3 benefits. How to club exports from different ports? DEPB - DES & EPCG: Clubbing Port wise is not required as Shipping Bills are clubbed File No. wise and License wise. Banks claim to have uploaded the data but this is not to be seen in the DGFT website. Data w.r.t. eBRC is visible on real time basis at the DGFT website. 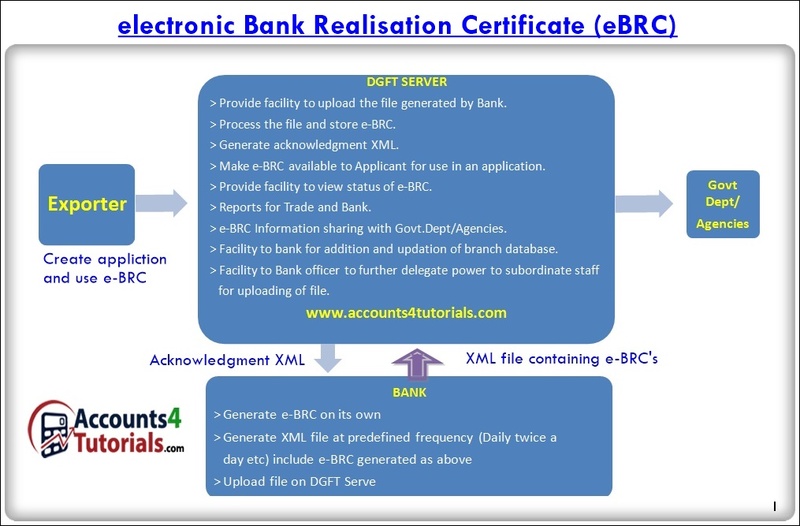 Banks get an automated message on successful upload of eBRC onto DGFT website. After this data can be immediately viewed by the exporter at the DGFT website. We are unable to add the details of commission, freight and insurance. I am unable to fetch data from the repository. Details from repository for various schemes are selected on the basis of certain predefined criteria like scheme applicability, port, date of exports, shipping bill date etc. as the case may be. Any mismatch will result in non selection of the data from repository. The system takes the lesser of the FOB value indicated in the shipping bill or the e-BRC, though shipping bill details of freight and insurance are approximations. What exchange rate to adopt for calculating the freight and insurance if the data is available in rupees? Can I use the same shipping bill for discharge of export obligation against two or mor advance licenses? What to do when the export obligation is in another currency? Exchange rate will be as on LEO date of the shipping bill. Will there be any random verification mechanism to ensure exporters mention the actual and correct freight insurance, etc? As is the practice for other documents, in random cases, exporters may be requested to produce supporting documents. I have already claimed DEPB on an EDI shipping bill earlier now I want to claim other benefit on the same shipping bill but I am unable to load already utilized EDI shipping bill? From the Administration menu Select the option “Link already utilized EDI DEPB Shipping Bill to Repository” and Select the Shipping Bill to be linked. For further details refer to Help (Q11 under heading How to?). I have added a Shipping Bill manually to the repository and claimed/not claimed a benefit. Now the shipping bill has been received in EDI mode from Customs but I am unable to add the same? From the Administration menu Select the option “Replace manually entered Shipping Bill with EDI Shipping Bill” and Select the Shipping Bill to be linked. For further details refer to Help (Q12 under heading How to? ).